U.S.-Turkey Relations Hit a New Low - Atlantik-Brücke e.V. The U.S. and Turkey hit a new low this summer that caught many by surprise. Unfortunately, however, the current crisis has been a long-time coming. The relationship between the two countries has been in need of serious attention even as the broader transatlantic relations seem to be undergoing a reset under the Trump administration. The initial honeymoon period that brought hopes of greater understanding between Presidents Trump and Erdogan has come crashing down as neither of the two leaders wants to look weak, as they depend on their strongman personas and images to govern. In both countries, foreign policy is driven by domestic politics and creating an “us versus them” rhetoric to consolidate power at home. With the Mueller investigation and upcoming mid-term elections in the U.S., Trump through Vice President Pence sees Pastor Brunson, a US national who was detained in Turkey on espionage charges, as an easy rallying cry for his evangelical base. The new nationalist parliament in Turkey is already using a more pronounced anti-American, nationalist rhetoric kowtowing to the far-right Nationalist Movement Party MHP. In other words, both leaders, President Erdogan and President Trump, have been willing to exploit these foreign policy crises to consolidate their power at home and strengthen their leadership positions. After a chummy NATO summit together, Trump publicly warned Erdogan over Twitter that an escalation was coming as a result of a breakdown in diplomacy involving a Turkish national released from Israel at Trump’s request, but the speed at which careful behind-the-scenes negotiations on the release of Andrew Brunson broke down is still breathtaking. The U.S.-Turkey collapse of trust has shown itself again and again in recent years. There can be no doubt that Brunson’s arrest in and of itself is not the worst in the long history of Turkish-American relations that has whether the 1974 Cyprus fallout and 2003 Iraq War. Still, its consequences have had immediate repercussions for bilateral relations and may be far worse on broader transatlantic relations in the longer-term. There are many nuances that make reporting on this relationship particularly difficult. From a Turkish perspective, major sticking points are the fallout from the July 15th failed coup attempt and its accused mastermind Fethullah Gulen living in Pennsylvania, as well as Turkish bankers and gold traders that have busted U.S. sanctions on Iran. From an American perspective, problems include the purchase of the latest cutting-edge fighter jet F-35s as well as S-400 Russian missiles which complicates relations with NATO that relies on interoperability and being on an American based weapons system, conflicting policies towards Syria, and finally, American Foreign Service Nationals being detained and denied diplomatic immunity. Pastor Brunson has become the proverbial straw that broke the camel’s back for the Trump administration, especially given the strength of the evangelical right and the absurdity of the charges he faces in Erdogan’s Turkey. US-Turkey relations now have to be reset; there is no going back to normal. On the political level, much like the “visa-crisis” of last year that dragged on for almost a month over a seemingly minor diplomatic breakdown, US-Turkey relations now have to be reset; there is no going back to normal. A fully-functioning State Department is necessary to deal with Turkey, given the Pentagon is far more anti-Turkey and pro-Kurdish these days vis-à-vis Syria. The imbalance in Washington between State and Defense must be righted. Assistant Secretary Wess Mitchell is uniquely placed to play a role as a sensible Europe expert that must take a tough but fair line on Turkey. In addition to a Senate confirmed Assistant Secretary, a permanent Deputy Assistant Secretary responsible for day-to-day relations with Turkey and an Ambassador in Ankara should also be a priority as tough love is applied more effectively in person than over Twitter or through press conferences. Turkey’s economy is at an inflection point and American leverage has never been stronger. At the same time, anti-American anger in Turkey is at a high, and balancing these two trends will be critical. The Anti-Americanism in Turkey has increased mainly because of continued American support for the YPG, the mostly Kurdish militia in Syria. EU-Turkey relations are looking much better as a result of the breakdown in U.S.-Turkey relations, and Turkey’s economy depends far more on the EU than on the U.S. Turkey is increasing its focus on the EU to secure its own future, regardless of where U.S. policy ends up going under Trump. Germany is still Turkey’s largest partner for trade, and Turkey has been basing this relationship on a win-win approach. In this context, Europe continues to be a reliable partner for Turkey particularly in comparison to America these days. Indeed, since the Justice and Development Party came to the power, Turkey has been willing to seek more partners and good neighbors around it. With Erdogan at the helm, Turkey has flirted with Russia, Iran and China, while trying to get away from Western values on different sets of issues. Because of clashing interests over the years and power struggles between the U.S. and other countries in the region, Turkey has been trying to seek alternative options for its foreign policy choices. This was abundantly clear on the most recent visit by the Emir of Qatar, which resulted in Qatar’s $15 billion promised infusion into the Turkish economy even as the lira plunged to its lowest levels yet this year. Turkey wants to reduce dependency on Western actors, creating more partnership options to increase pragmatism and flexibility in foreign policy decisions. Another current example is the first high-level meeting between Turkey and the BRICS countries, with whom President Erdogan expressed desire to further collaborate. At the first Turkey-ASEAN trilateral meetings in Singapore, Turkey indicated its approach for seeking areas of cooperation with the member countries in the region. In addition, through the Astana Process, Shanghai Cooperation Organization and many other multilateral forums, Turkey is seeking to engage with emerging powers and organizations on the global stage, leading the way for a transforming balance of power internationally. Perhaps the most immediate concern for the transatlantic alliance has been Turkey’s turn towards Russia to buy major weapons system, specifically the S-400 missile defenses. This has created problems both with the U.S. and among the NATO alliance over military interoperability. Turkey also wants to build more ties with different actors or organizations in the world. Saving Turkey as a transatlantic ally is imperative in the long-term given the historic investment that has already been made by successive generations. Taking into account the shifting dynamics in both American and Turkish domestic politics and foreign policy environments, there has never been a more opportune moment to double-down on an equitable partnership of shared interests that Europe can help facilitate. 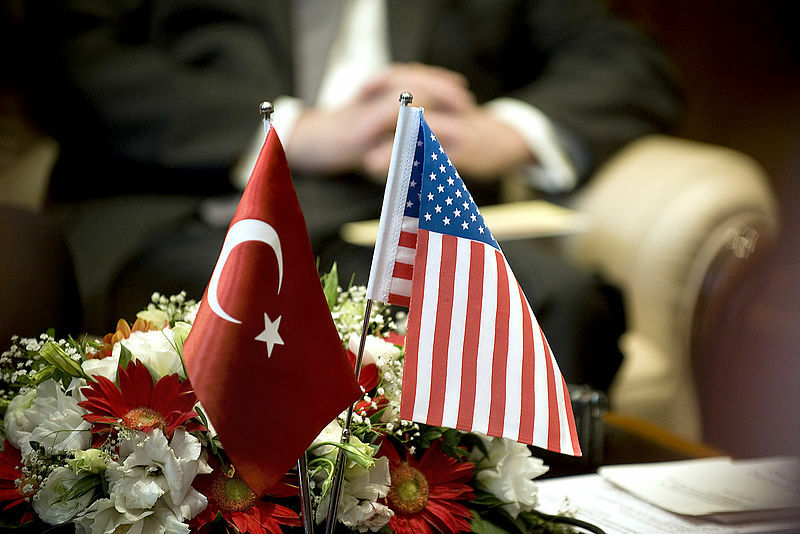 Ultimately the U.S.-Turkey relationship will be determined not just by the presidents, their war of words or even their governmental colleagues in Washington and Ankara, but by the businesses, civil society, educators, entrepreneurs and leaders from Istanbul, New York, Izmir, San Francisco, Bursa, Boston, Kayseri, Chicago, and beyond; that is why both governments and nations must make a concerted effort to expand relations and save the alliance. Joshua W. Walker, PhD (@drjwalk) is a longtime Turkey watcher who is a proud Atlantik-Brucke Young Leader based out of Washington, DC currently Global Head of Strategic Initiatives at Eurasia Group, Executive Vice President of the American Turkish Council and a Transatlantic Fellow at the German Marshall Fund of the United States.